Learn how to ask your hairdresser for the dark hair with caramel highlights you want! Don’t go to your next hair color appointment unarmed!! You must do your best to communicate what you hope to attain for the result. For clients who have a hair color or a hair color technique that they are looking to create, I always would suggest they bring in a picture or two of what they have in mind. A picture in this case really does speak a thousand words! A picture in hand will put us both on the same page and from there we can talk. When it comes to asking for “dark hair with caramel highlights,” check out the slight differences these celebrities get because of the techniques used. There are a number of effects you could come home with in just asking your hair colorist for “dark hair with caramel highlights,” and knowing precisely what you are asking for may make the difference of having good or bad hair days to come! Kate Beckinsale’s dark hair was first lightened all over followed by then adding the highlights. Therefore there is less of a contrast from her dark hair and the caramel highlights than Elsa Pataky’s hair below. Kate Beckinsale’s caramel highlights are also more noticeable because when highlighting the hair colorist weaved out slightly larger pieces to be highlighted from slightly wider sections than those of Elsa Pataky’s hair. Elsa Pataky’s dark hair has subtle caramel highlights in it and it’s gorgeous on her! If you want this type of hair color effect, ask for caramel highlights to be placed in the hair by weaving very small amounts of hair out of very small sections. This type of sectioning makes the hair look sun-kissed all over rather than creating streaks of highlights throughout dark hair. Eva Longoria’s dark hair only shows a few pieces of caramel highlights framing the face and on the crown in the left picture. This type of highlighting may be all you need to change-up your dark hair. This can be done freehand by hand painting the pieces in the area you choose. The term for this type of highlighting is Balayage, which originated in Europe. This type of highlighting affects the top layers of hair only. In the picture on the right, Eva Longoria still has highlights but they are placed in her hair by weaving fine strands out of very small sections. Instead of caramel highlights these are a bit warmer and show more warmth. This highlighting technique is unique and fresh! 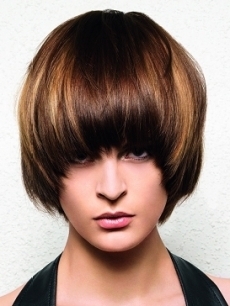 The underneath layers are lightened to contrast with the natural base hair color. Highlights frame the face but start a few inches from the roots. There is nothing symmetrical about this highlighting technique and when done in subtle hues, it has a ‘haunting’ effect. You definitely want to bring in a picture if this is your goal. Chunky highlights describes this highlighting technique quite well. When the high lighted pieces are this clearly visible, they are weaved in big chunks out of wide sections of hair. If you are looking to lighten your dark hair with caramel highlights, make sure to bring pictures of what you have in mind . . . you’re much more likely to come out with what you are hoping for! For more highlight ideas check out our Pinterest Hairstyles with Highlights Board. October 26, 2012 By: Barb Quinn Hairstyle Blog Leave your comments (4), Your input matters. (This doesn’t mean there aren’t other qualified colorist in your area, it’s just one resource for good colorists. this article is very helpful. i love it. most of the time i don’t get what i want with my hair. if i show a picture of what i want, i get something completely different. Now i can be more specific!